With refacing gaining in popularity, we offer everything you will need to reface your cabinets correctly. From solid wood refacing trim to veneers, plywood and edge banding, we have you covered. Click a category below to expand its offering and then select any item to see its full specifications and available sizes. All our Veneers, plywoods and refacing materials can be viewed below or, for your convenience, you can download the entire catalog below as well. Whenever you have an exposed edge or plywood, you will need to band it. While this is rare in refacing, you may run across a situation where you need to band the front edge of a frameless cabinet box, a shelf or some other 3/4″ thick panel. 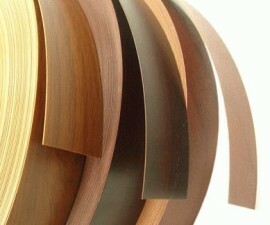 Our edgebanding comes in 500 and 250′ rolls and is available finished or unfinished. We offer a variety of plywood in full sheet or cut to size. Thicknesses of 1/8″, 1/4″ and 3/4″ are available. 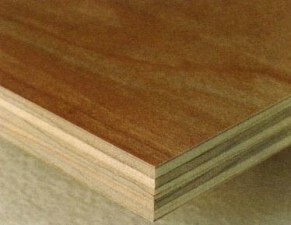 3/4″ plywood is available edge banded and 1/4″ plywood is available with grooving. click below to see our entire offering. 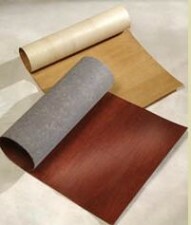 We offer veneered of almost any specie and are available with a poly backer or a wood backer. These veneers can be used in conjunction with our custom specie cabinets to skin exposed ends, soffits, or other flat surfaces. They can also be used to create a truly awesome kitchen reface! Solid wood refacing molding is the perfect way to reface your cabinet’s face frames. Simply order the exact width you need and cut to length as needed. The molding installs with glue and a 23 gauge pin nailer and provides an easier way to reface your cabinet face frames than using veneer and messy glue. We provide an explanation of how this product is used in our Refacing Tips section.